This is not your typical list of things like snacks, a kindle or a scarf (because I've already done that), but rather (hopefully) contains things that you might not have thought about before. Not that there is anything wrong with those things because hello they are necessities, but this is for things a wee bit out of the box. Some of these links are affiliate, meaning if you click, I make like 2 cents. Ta! 1. A portable charger. I bought this one, but here is another and another. I have never used one of these before and never felt the need for it. But, I've never really travelled anywhere where I would use my phone or kindle for long periods of time without having the ability to charge (i.e. walking around Paris and taking all the photos). Since it was only $12, I thought it was worth it. Turns out it was bloody brilliant. We used the heck out of it. 2. A tote bag that folds up. I bought this one, but here is another and another. This turned out to be a better purchase than I had anticipated. I always end up carrying things when we travel - souvenirs, food, whatever. 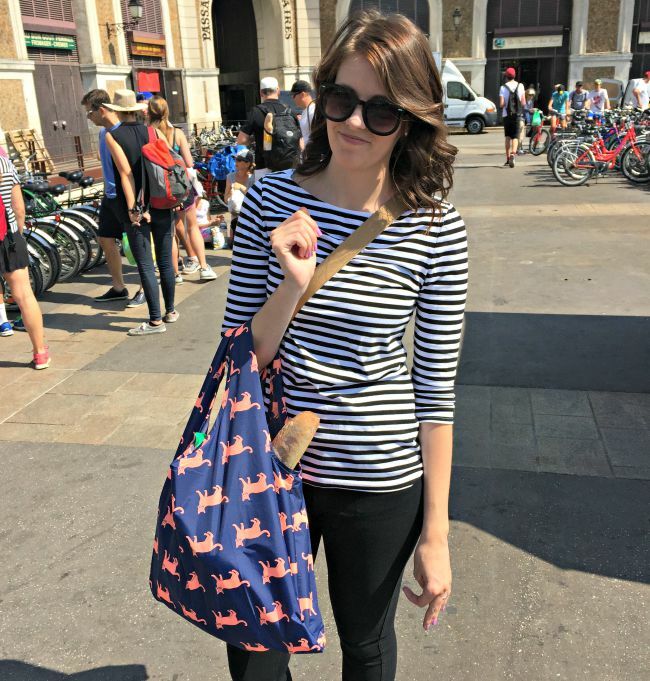 I got this bag - that folds up neatly and tucks into my crossbody bag smaller than my iphone - for those instances, for when we went to the farmers market in Versailles or had a picnic in front of the Eiffel tower. Places can charge for plastic bags, so this was super helpful. I also liked that I could fill my backpack up to it's breaking point and use this as a carry on for the way home, if I wanted to. By the by, I totally got the one with kitties on it. 3. Travel surge protector with USB thingy. I bought this one, but here is another and another. You still need an adapter with these, and possibly a converter but I only brought things that were dual voltage or specifically for travel. I love this for international travel because we often only have one adapter, and multiple things to charge or use. So with this, I can curl my hair and charge my phone, kindle and camera at the same time. Brilliant. 4. A clear pouchy makeup bag thing. I bought this one, but here is another and another. I know, I know, super glamorous. Here's the thing - when I travel, I carry on. So my liquids need to be a certain size and they need to be in a clear bag. I normally use a big zip lock bag, but I wanted something a bit more permanent and less flimsy, so I could use it for all my makeup as well. You can buy these almost anywhere, I wanted this specific one because of the size and compartments. Technically you are still supposed to put things in zip lock bags or something TSA approved, so I had my actual liquids in a small zip lock bag and prepared to play dumb if they said anything, but I only had to take them out once (leaving Rome). 5. A water bottle that folds up. I bought this one, but here is another and another. Okay, I know this is a bit... really, Kristen? But bear with me. I have a crossbody bag that I use when I travel. KC uses his pockets, but more often than not, everything ends up in my bag. Including the water bottles that we always end up getting and they weigh my bag down. I know I seem like a bit of a diva, but holy heavy. I wanted to bring a water bottle because I knew that it would be expensive to keep buying bottled water everywhere we went and some places in Rome have water fountains that we could fill the bottle up. Anyway, this was fabulous because it folds up super little and tiny in my bag and holds a litre of water (almost 34 oz). We used it a bunch. I wasn't worried about filtering the water or anything, it all tasted fine and we are still alive. This was perfect for what we needed. 6. A selfie stick. I bought this one, but here is another and another. Yes, I'm slightly embarrassed but Biana recommended it here and I impulse purchased and it was the best decision ever. Yes, we looked like dorks and people still took a few photos for us, but for your run of the mill selfie with a wee bit of background instead of wowthatsreallyclosetoyourface - they are genius. See below. 7. Cute sunglasses. These are mine, but I like these tortoise shell ones and these wayfarer's. Yep, I went there with my vain self. I have learned from bad photos and I won't make that mistake again. You define what is cute, and hopefully you don't own any sunglasses that you don't think are cute. I have photos from travel or events where I hate the sunglasses I was wearing (why was I wearing them?) or I was squinting because I thought the photo would look better without sunglasses. When we travel, we are more than likely outside a lot of the day and the sun is too. So, wear some cute sunglasses and don't regret your photos. 8. Comfy shoes. I wore my Nike's, my crocs and these flats from Target. But these Mary Janes are super popular, and I wanted these sneakers because they are way cuter than Nikes but didn't want to buy them just before Europe. I know, again I'm sorry with the captain obvious, but nothing ruins a trip like uncomfortable shoes. When I was younger and travelling around England and America, I wore flip flops. No big deal. If I tried to do that now, my back would hurt after a couple of hours, my knees would scream at me and my hips would need a replacement. Okay, slight exaggeration but yes I want to look cute but being comfortable is way, way, way, way (way!) more important. I went back and forth (and back and forth and back and forth and... you get the idea) on the sneakers but in the end I am so freaking glad I brought them because my feet were fabulously comfortable the whole time. 9. Travel curling iron. This is mine, but here is another and another. You might not care about this. I didn't want to see a rats nest in all my photos, so I knew I had to bring something. This works just as well as my normal ones. I have blown up curling irons and straighteners before, so one with dual voltage is a must. I hate to sound vain but I received lots of compliments about my hair on our trip and it's because of this doodad. Bonus! A kindle. Because how can you travel without books?! Are any of these essential? Nope. Are they fun and make life easier? Yep. 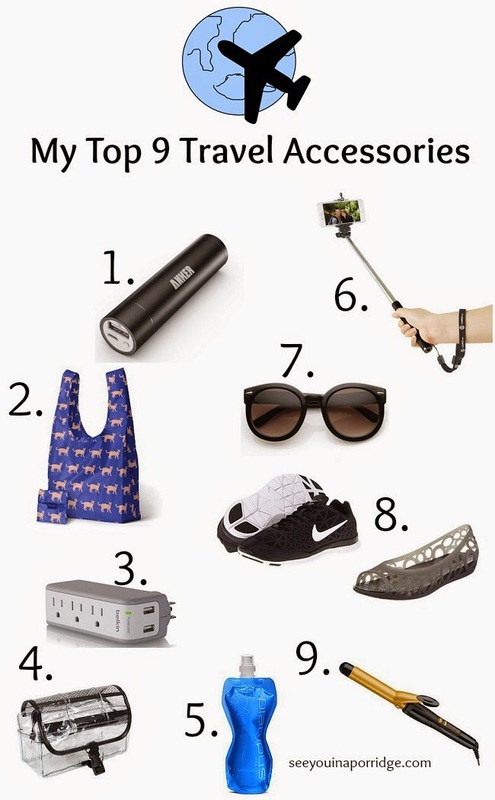 Do you have a favourite travel accessory? Your hair looks so amazing in that last pic! I never even bother to curl my hair while on vacation because it never stays. Boo. And love the fold-able tote bag! Such a smart idea! A fold up tote and charger is sooooooooo smart, never thought of those :)! I almost feel as though you just gave me a list of "Things I should carry always" because I just realized I never know what I'll need water and I'm ALWAYS wishing I had a spare bag...that isn't in my apartment or my car. Also, I have a portable charger that has a key ring and I can't imagine life without it. All good ideas! I have actually not thought of the water bottle option before! That's so much better than my big bulky one I always carry! These are all good suggestions! I like the fold-up water bottle because bottles are bulky and you're right: everything ends up in my bag! And I keep fold-up bags in my car so I have them just in case. I love this post! So many great suggestions. I always travel with a little fold up tote, I used it constantly when I was in London. I did bring a water bottle with me but mine was not fold up. Need to look into that. I'm so mad that I didn't bring a selfie stick with me. i just got one and cannot wait to use it. These items are genius!! I think I am going to go ahead and purchase one of those fold up totes because you never freaking know when you might need one of those for real!!! I have yet to plunge on a selfie stick, but if we traveled like you did...I would probably have one. If I whipped that out around Birmingham, I would feel like an idiot lol. I'm with you on 1, 2, 5, and 7. I love your tote because KITTIES!!! I went from having no portable chargers to having 4 in about 3 months time. They definitely come in handy. Your hair looked gorgeous in all of your pictures so I vote for the curling iron as the MVP of your trip, lol! I want a collapsible water bottle just to have daily to carry around!!!! selfie sticks!! i needs to get me one and i don't care how asian i will look because they are damn handy. i have reusable bags that fold into a little ball and i love them! A portable charger is key and I always forget mine at home. This also reminds me that I need to invest in a selfie stick...Your hair looked fabulous on the trip! I love that you got the bag with the kitties, it's adorable. And look at you all French like with your baguette sticking out. Too cute. I have a USB charger that has 2 USB ports and it is a life saver for charging my phone and iPad. I think a portable memory card reader is a must! 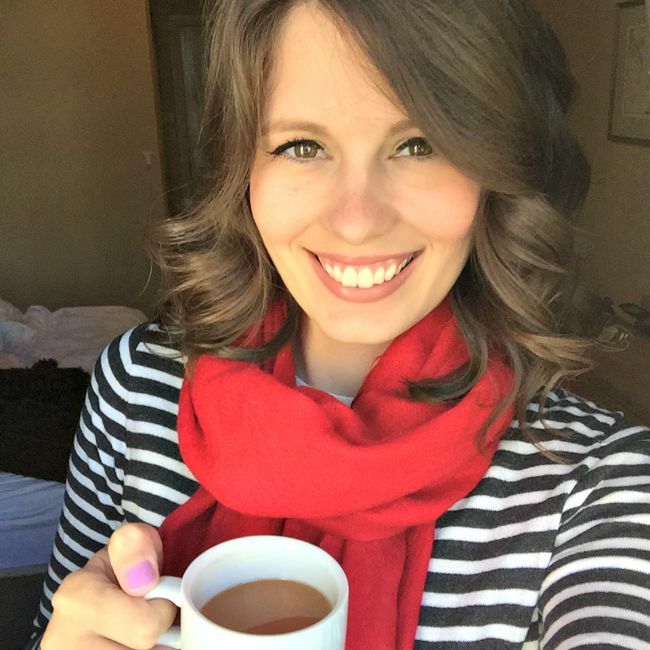 You with the curls and the striped tee + scarf and the liquid liner ...so French. :) So cute! I wish I would have had a selfie stick when we went! Everyone in the touristy areas had them, so I wouldn't have felt stupid. That bag and water bottle is a great idea too! It's always on my pre-travel to get list, but I still haven't gotten either. Great list girlie! Folding water bottle! We carried water bottles when we went to Europe, but they were hard plastic, and by the end of the trip, my camera bag was worn out from having that extra bulk pulling on the seams. It's amazing that I didn't get pickpocketed because my bag had giant holes in it. Your hair looks fantastic. Always. This is so awesome, love this post! I'm reallllly starting to want a selfie stick. And since added bonus: they've been saving people's lives in the news why not!? All are great ideas! Oh my gosh. TOTALLY. I second all of these things. Ahh, the selfie stick! My brother had one and we had far too much fun with it & the lake house a few weeks back! Where has this been my whole life?! I have to say, the selfie stick has been my new go to! I even to it to a Royals game and it fit in my cross body perfectly and I got the jumbo torn/field in the background so none of my friends made fun of me! really cute! I have a selfie stick too for hikes & travel. I don't lay around and take pictures of myself with it but it is good in a pinch when you want that view! Love the charger too! I saw that at the store in a rush out and didn't buy one but I certainly need to! girl the selfie stick is growing on me, they are SO convenient!! haha I love that travel bag!! It's cute and folds up which is a WIN when trying to fit 100 things into a suitcase. I need to invest in a travel curling iron, those things are so smart! I love your selfie stick pics...I keep seeing people with them at the beach and they make me giggle but I can totally see how they'd be useful on vacation. And ugh, I blew up my expensive straightener in Italy (because I'm really smart like that). I didn't know that fold-up water bottles exist but I definitely need one ASAP! So genius. The foldable bag is such a good idea! The only thing I would add is to order sim cards from the country you are going to. Plus a sim card from france, for instance, will work in all EU countries. That way you can still use google maps if needed! If we go anywhere, even for one night, I always bring pads and/or tampons. I never end up needing them, but I would probably get my period if I did not bring them! These are brilliant. We are going on vacation in September and it's our first trip on our honeymoon where our packing was a total disaster. I packed the most random assortment of items and forgot half our essentials. I guess I was a little preoccupied with the wedding lol! So this is going to be so helpful! Thank you! Thanks for the list. I will definitely check the list when I travel next. I need to buy a selfie stick though. Prices are reasonable, food is delicious, and wait staff is sweet, conscientious, and adorable. I came here for an event, got contained to upstairs. Service at party places in the Bronx was prompt and food was awesome. yes to all of these! and a curling iron is most definitely packed. my hair looks wild and frizzy without one. i need to get a selfie stick. i was sent one but it was broken, so i need another!! that makes perfect sense to get one. Your hair looks awesome in that last pic! These are great ideas! Yes to the travel surge protector! One of our problems in Rwanda is many of the rooms only have one charger. When you put two (or three) to a room, it's like fighting over that outlet! We bought a full surge protector last year but it was so bulky! We will be investing in one of those! And I loved your hair on the trip...I'll be checking the curling iron out! 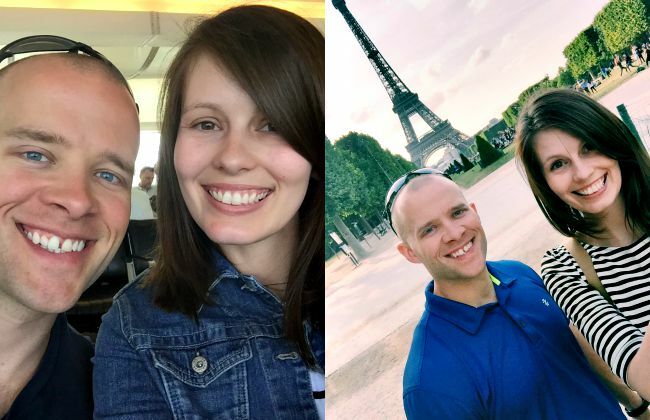 And lastly, as cheesy as they look, the selfie stick is really a great idea for travel. Especially since Cory has super short arms! Well, it looks like I definitely need to get that portable charger and the fold-up tote bag - what a genius concept! I feel silly for not thinking of that before. And, hello travel-friendly curling iron - that definitely will be mine in the near future. Your hair did look pretty gorg, by the way. Sunglasses, my Nook & flat iron are a must for me! I can't travel without these ever! OMG! These are all so clever. I definitely need to get a portable charger and that tote bag!! So many good ideas! We have bag taxes here, so we always use reusable bags, but I've never thought to have one when traveling-- but it's such a good idea if you're picking things up. I love that clear travel bag too.